Whether you have just lost a tooth or have been wearing a denture or bridge for some time and would like a tooth replacement that feels more natural, a dental implant can be the perfect solution. Dental implants most closely replicate the structure, performance and appearance of a real tooth. At Dental Expressions, our dentists use dental implants in Freedom, WI, to rebuild smiles that are healthy and attractive. Other tooth replacements like full and partial dentures or crown and bridge only rest on top of your gums. In this way, they replace just the crown of a missing tooth. 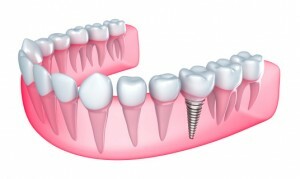 A dental implant, on the other hand, permanently replaces both the root and the crown of a tooth. Therefore, your dentist in Freedom, WI, is able to help you securely replace a missing tooth and ensure the health of your jawbone. Because the implant is embedded in the bone tissue, it is able to stimulate the jaw every time you bite down. This action encourages healthy new bone tissue growth and prevents bone resorption that can lead to a sunken facial appearance. In addition, dental implants can last a lifetime when given proper care and hygiene. A dental implant near Kaukauna, WI, is comprised of three distinct parts. First is the implant itself. This is a small titanium screw that is implanted in your jaw. Made of the biocompatible metal titanium, the implant integrates with the surrounding bone to form a new and stable tooth root. Second, is the abutment. This essentially serves as a connector between the implant and your tooth restoration. Usually made of ceramic or titanium, the abutment ensures a tight fit between your implant and the crown of your new tooth. Finally, there is the crown. When the implant is fully integrated and the abutment has been attached, your dentist near Appleton, WI, will attach a porcelain crown to complete the replacement. From start to finish, receiving a completed dental implant can take from three to nine months. Sufficient bone density is critical to the success of an implant. Therefore, a bone graft procedure may be necessary to build up bone before surgery to place the implant. While Freedom, WI, dentists Drs. Bob and Heather Heil do not perform this surgery, they provide the restorations once your implants have been placed. To learn more about how a dental implant can replace a missing tooth in your smile, please contact Dental Expressions. We serve patients in Freedom, Appleton and Kaukauna, WI.